These clips are used by many celebrities like Jessica or Simpson in many fashion magazines shoot. It’s really very amazing, and also saves your lot of money and valuable time that you waste in salon. With these beautiful clips you can easily create a long gorgeous hair in little time, and take them out whenever or wherever you want. You can purchase them in sets for £30 i.e. approx $65. These hairs exactly look alike the hair extensions used in salons, it’s just that these hair extensions are woven onto tiny hair clips. You can very easily stick these clips along the length of your hair, and it doesn’t require any glue that may damage your hair. It’s very durable and you can take it off whenever you want. So don’t waste your time go buy these clips and have a celebrity look!!! If you want to make your hair extensions look natural, the best idea which I can give is that try to have three or four horizontal layers on your head by separating your hairs in sections using a comb, your extensions will automatically have a natural look. 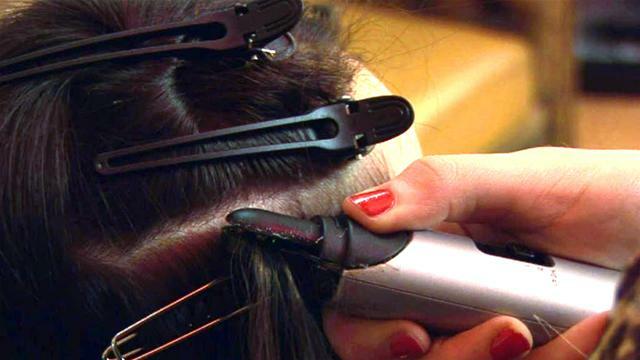 You should also ensure that your hairs are fully concealed, by leaving a fair amount of hairs on your head. 3. 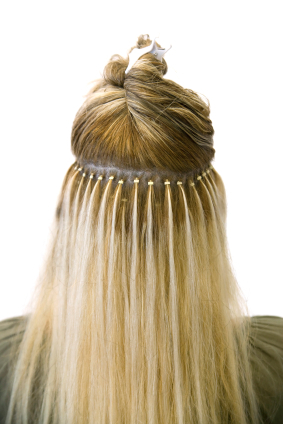 Clip the hair extension securely: After you have partitioned your hair into section, take each strip and clip the hair extension underneath each separated layer of hair at the roots. Repeat this procedure until all the hairs extensions are securely clipped. 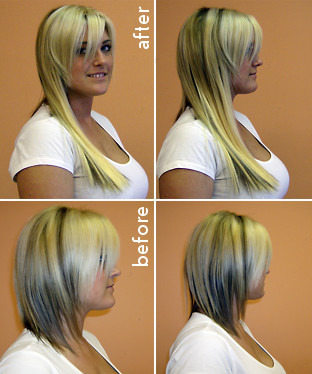 The hair extension you will use should be of same texture and color as your own hairs. If the color doesn’t matches, you will have to dye your hairs so that it matches 100% perfectly with your hair extensions. You can buy a best low prices hair extensions from EBAY. Search in Google about human hair extensions, and seller products which range in color, texture, style and quality according to your choice and price. Best tip for having perfect hair extensions is that practice a lot. Practice will make you perfect and eventually lead to perfection. If you want to become a pro in it just make sure that hair extension should be exactly identical to your own hairs and good styling with perfection will make it look natural. To have a consistency and same density all over, you should use a lot of hairs. It will give you a very natural look. Unless you want to have a more emo style or scene style, there you can use a lot of wefts. Be careful in handling hairs and also brush your hairs gently. You should use gentle shampoo and intensive conditioner. Beware of bad hair days; it happens when you will not properly clip the hair extensions at the roots. You can wear these extensions till many days you want. But you will face a problem that is your hairs will tangle after few days of constant wearing. Don’t be stressed or don’t try to entangle the hair directly. Just take them out of your hair and then restyle them. It will just take 10 minutes for the whole procedure.